Understanding power phase is integral in the process of choosing the pump configuration that is right for you. Unlike direct current (dc) power, which provides constant levels of voltage, alternating current (ac) power follows a waveform alternating between positive and negative voltage. Because ac power is easy to produce and transmit, it is the power of choice to transmit to homes, commercial buildings, and industrial facilities. 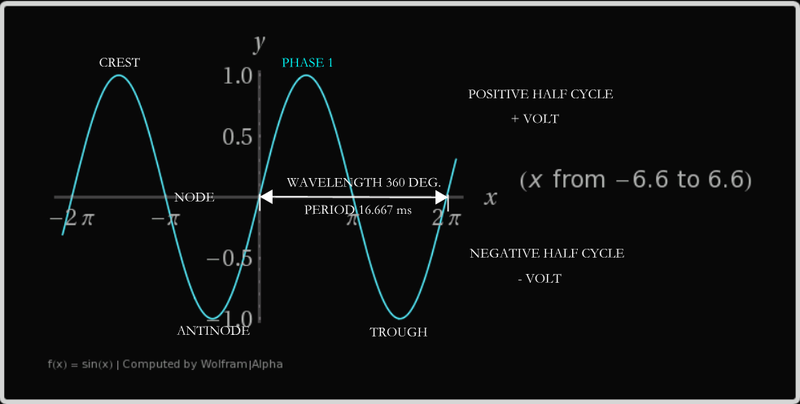 When talking about alternating current, phase is used to describe an instantaneous point on a waveform cycle. When all of the instantaneous points are taken together over a completed cycle, the result is referred to as 360° of phase or more generally a phase. It is standard to have the reference be the phase that passes through the origin. This standardization gives the phase the form of a sine wave and creates nodes, or points of 0 current, at 0°, 180° (π), and 360° (2π). As the wave passes from crest to trough the amount of current provided matches proportionally. The most common power phases are single- and three-phase. 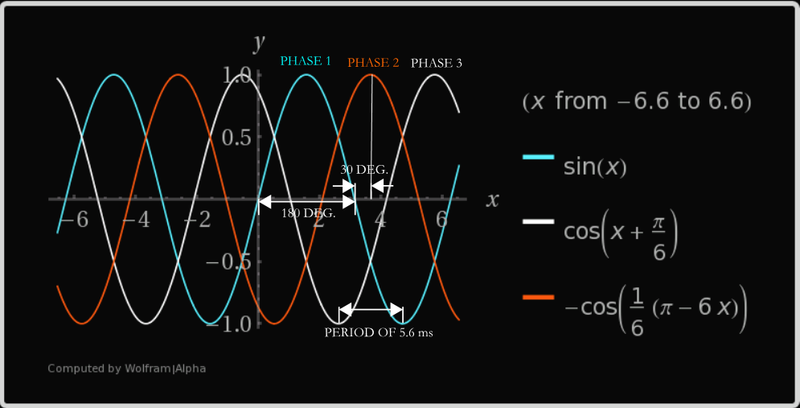 When dealing with multiple phases, the offset in time or degrees between the same reference points on two waves traveling at the same frequency is called the phase difference. Phase difference can tell use the amount of time or distance between maximum current draw. 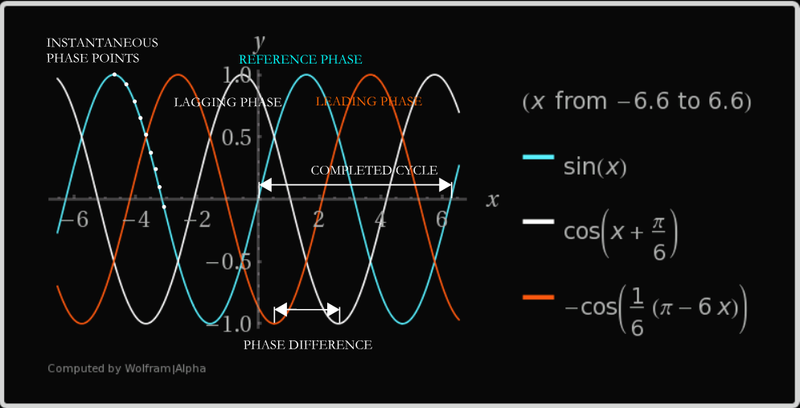 Consequentially, the waves behind the reference phase are called the lagging phase, and the wave before the reference is called the leading phase. Refer to Figure 1 for a representation of each of these terms on a standard three-phase waveform. Figure 1. The general arrangement of a three phase waveform. Single-phase power is commonly found in residences and commercial buildings and is primarily used for powering small appliances under 1000 watts. This configuration may either be a simple 120V or a split phase configuration with 120/240V. Single phase is either a two or three wire ac circuit. In older wiring designs there is one power line and one neutral line. New designs add an earth to ground connection to improve safety. Although single-phase power is available almost everywhere, it is not recommended for use on motors greater than 5HP. When comparing two motors with the same horsepower rating, the single-phase motor will draw significantly more current than the three-phase motor. Because of the larger current draw, larger and therefore more expensive windings are required. In addition to being physically larger, single-phase motors are generally less efficient and require a starting capacitor which adds more to the cost. For these reasons, we recommend that three-phase motors be used when available. See Figure 2 below for more specific waveform configuration and power phase information. Figure 2. A simple sine wave with a period of 360° and an amplitude of 1. In single phase power the x-intercepts are 180° from each other. A full period is 360°. A single phase motor has a crest approximately every 16.5 milliseconds giving the motors a tendency to vibrate more, which may contribute to a shortened bearing life. Single phase 120V motor rotation cannot be changed without much difficulty after the motor has been manufactured. It is absolutely necessary to make sure that the rotation of the motor matches the desired rotation of the pump impeller. Three-phase power is usually found in commercial and industrial facilities where large equipment is operated. Three-phase is usually distributed in the Wye configuration with five wires. Three of the wires carry current; the fourth wire is a neutral, and the fifth wire is an earth-ground wire. In the less-common Delta configuration there is no neutral wire. Although other configurations exist we will not discuss them in this introduction. Three-phase power, where available, will provide smooth, more balanced, and frequently less expensive motors and motor operation. This is due to the fact that three-phase power has three identical overlapping waves. The wave cycles are evenly spaced 120° apart so the supplied power remains relatively constant when compared with single-phase power. When phase one is at a node, the next phase is only 30° and approximately 5.5 seconds from reaching its crest, and so on for each passing phase. When compared to a single-phase power supply that uses the most common configuration (phase and neutral), a three-phase supply with no neutral, and the same phase-to-ground voltage and current capacity per phase can transmit three times as much power using just 1.5 times as many wires. Because of this, the ratio of capacity to conductor material is doubled making it possible to use smaller, less expensive wiring. See Figure 3 below for more specific waveform configuration and power phase information. Figure 3. Three phase power has three identical sine waves overlapping at an offset of 2π/3 radians or 120°. When one phase reaches an x-intercept or node the next phase is only 30° and approximately 5.6 milliseconds from reaching its crest. Understanding alternate phase and wiring configurations is key to finding the best configuration for your application. Available power phase can have a major impact on your choice of motor and pump design. Understanding these basic principles will help you to understand motor efficiencies, start-up operations, and operation/maintenance costs. Please let us know if you have any questions about the ideal configuration for you. To learn more, check out our post on Pump Power Frequency and Alternating Current (AC). I didn’t realize that three phase power configurations on well pumps uses overlapping waves to provide constant power. My sister is having a home built for her family in the hills. Hopefully, she can use this info to choose a set up that can supply her family with constant water. Thanks! You are welcome! Good luck with your project and a steady flow of water! One of the water pumps in the city broke a week ago and it got me curious about them! I didn’t know there were different power phases for pumps before. That is really cool that the most common power phases are single and three-phase! Thank you for all the information! Thank you for the comment Deb! We are glad you found the article useful. Hi We have single phase power available but we want to use a 3 phase in the pump. Is this possible. What is the life span of a 240 vs a 3 phase pump? Thank you for your question. It is not possible to operate a three phase motor on single phase power without a piece of equipment called a phase converter. Digital phase converters are commonly added to variable frequency drives (VFD), and can be purchased from most motor shops or local electrical contractors. Keep in mind that if you are using a variable frequency drive, you need to either purchase a motor with a shaft grounding ring, or install a shaft grounding ring on your existing motor to insulate the bearings from stray voltage. Here are a couple of sites to check our for more information. I have a scenario in which I have a single phase connection available. I need to use a centrifugal pump of 5 hp which will pull water and throw to a stream of 600 ft.
1. Does single phase hold the load of 5 HP. 2. If yes will 5 HP pump be good enough to cover the 600 ft distance. 3. What can be the atlternative with a limitation of having a single phase connection only? Can a phase converter helpful in this scenario in order to make it three phase and use a 3 phase pump? Thank you for your questions. Hopefully this helps. -5 HP motors are commonly run on single phase power. If needed, you could also easily find a 7.5 HP motor that uses single phase power. -Aside from the distance the water needs to travel, there are a few more factors that you will need to take into account when determining the power requirements of an application. This step can be a little involved, so I would recommend that you reach out to a local pump distributor to help you with your specific application. The basic information you will need to know is required flow (GPM), total dynamic head (TDH), specific gravity of the liquid being pumped (1.0 if clean water), and pump efficiency. Your local distributor should be able to help you either find or calculate this information. 3. What can be the alternative with a limitation of having a single phase connection only? Can a phase converter helpful in this scenario in order to make it three phase and use a 3 phase pump? -Knowing when to use a phase converter can be a tricky decision. I recommend first doing some research to see if a single phase motor will work, and then revisiting this question if you’re out of options. Thanks Brian for prompt response. Very helpful information. I learned a lot from your article. Thank you Hussain, glad the article was informative and useful! What 3 phase cable size do I need to run two 5.5 KW 3 phase water pumps running in tandem at a distance of 450yards from power supply. The supply is 240v. Thank you for your question. To be able to size cable, you would also need to know the following information. -Amp draw of your motor. -Allowable voltage drop (usually either 3%-5% of the source voltage). If you are powering both motors from a single power source/cable, you would need to rate the cable for both amp draws, or double the cable size requirements of a single motor. I want to install a 3 phase (208v) standby generator at my residence. The grid is a delta configuration or stinger leg. The only 3 phase equipment is a submersible well pump. Does the standby generator need to produce power with one leg as a stinger? Thank you for your question. If the motor on your submersible pump is 3 phase, you will need to use the high-leg of your generator to operate it. Here is a helpful article that may explain things more completely. I would like to know single phase and three phase submersible pump advantage. If I use three phase motor, my power cost comes down? or single phase pump will consume higher current? While using a 3 phase 5HP submersible agricultural pumpset, at times 2 phase is provided. An autostarter switch is used, which means the pumpset may run on the 2 phases and burnout. Please name and describe a tool to prevent 2 phase run and burnout. Can a protector be installed within the motor to stop it when 2 phases alone are provided? I would recommend contacting your power provider and see why the third leg of power is being lost. There are protectors you can purchase. I would recommend Googling a electrical control panel shop in your area. They should be able to provide a control to prevent the pump from engaging when you are having power issues. I would like to ask if there is any way i can use vfd in my single phase water pump. my power source is 3 phase but the vfd available in our local store has single phase input and 3 phase output. how can i use this vfd in my single phase water pump? There are a few options to convert three phase incoming power to a single phase output. There are drives available with these capabilities built in, but here is a quick summary of a few ways the conversion could take place. 1. Convert the incoming three phase AC power to DC using an electronic rectifier, and then convert the DC power to single phase AC using a single phase inverter. 2. Use a single phase transformer across two phases of the incoming power. This is only acceptable up to about 400 volts. 3. Use a open delta transformer. Using this transformer effectively double the acceptable voltage rating as compared to a single phase transformer. I recommend talking to a local control shop for their recommendation. All of these options should be reviewed and implemented by an experienced electrician. Please note that the phase is a characteristic of the motor and not the pump. At the same HP, the phase will have no effect on the performance of the pump. How to identify the motor are of single phase or a three phase.if there is no name place on motor? Thank you for your question. The easiest way is to look at the terminal box. If it has a capacitor and has only 2 wires it is single phase. If there is no capacitor and there are three wires, it is three phase.